These two late-60s shots caught two venerable trains approaching their last days. 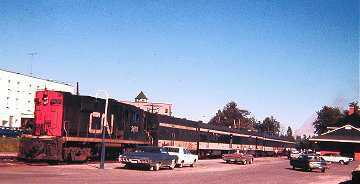 Santa Fe's Grand Canyon, here photographed in Albuquerque, was the workaday third train on a route featuring the Chief and Super Chief. 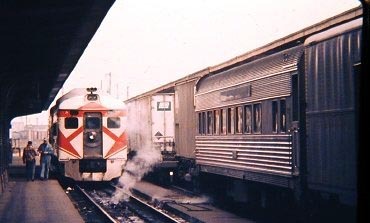 Nonetheless, it carried a full complement of lounge, sleeping, dining and chair cars between Chicago and Los Angeles, and sleeping and chair cars which connected to and from Dallas. Easy transfers could be made to secondary runs to Santa Fe, NM, and El Paso, Texas. It was heavy with mail and express. 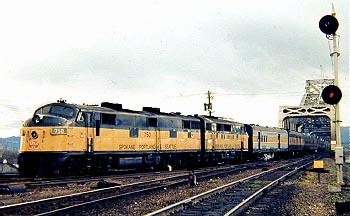 Spokane, Portland and Seattle Train #2, shot in Vancouver, Washington, on its way between Portland and Spokane, carried sundry coach and sleeper equipment for Northern Pacific's North Coast Limited and Great Northern's Empire Builder. I recall both trains as being full, with good doses of the spit and polish all the carriers were known for. 1971, Buffalo's magnificent Central Terminal. It was the last days of the Penn Central, which was sinking fast. The famous Water Level Route of 20th Century Limited fame had but three trains a day, not one of which had a name (strangely, the East-West ones on the old Pennsy still kept theirs), and what was left was a skeleton service with only one train (the overnight #61 and 28) between New York-Boston and Chicago carrying anything resembling a full set of lounge, dining, sleeper and coach equipment. 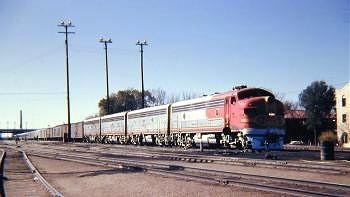 I rode the last #61 between New York and Buffalo before Amtrak took over and it was a wreck of a train, delayed for hours because PC had sold its cab radios -- as well as most decent equipment -- to Mexico. The grand old, and now abandoned, station was an empty tomb most of the time, a drafty homage to a once proud city which in the last 30 years has continued its own precipitous decline. The RDC is Toronto, Hamilton and Buffalo's connection to Toronto -- the only US connection to the great Canadian city. This is all a stark reminder of what Amtrak inherited, and how far it has come in many respects. 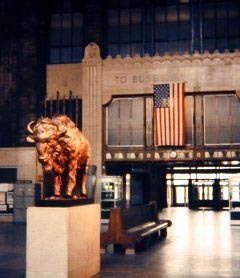 In fact, Amtrak's first New York-Chicago run, the night after my ride, not only arrived and departed Buffalo on time, but left many passengers expecting the usual one or two hour delay, well behind. It's the summer of 1967 and the westbound North Coast Limited, pictured here mid-day on the Montana high plains somewhere near Billings on its way from Chicago to Seattle, was a magnificent train, complete with first class buffet-lounge (with observation), dome and standard sleeping cars, a slumbercoach, dining car, standard and dome coaches and the Lewis and Clark Traveler's Rest Car. Oh, and don't let me forget the gigantic Idaho baked potato served with great style in the dining car I was to ride a year or so later. Back in the mid-late 1960s Canadian National and Ontario Northern ran trains into many remote areas of Northern Quebec and Ontario. When I visited in the summer of 1969 one could still find examples of backwoods branch line railroading. On the left is CN's daily Montreal and Quebec via Hervey train parked in the station at Cochrane. Served also by the Northland on Ontario Northland rails from Toronto-North Bay, Cochrane was was also the terminis of the Polar Bear Express, a wildly popular tourist run up to Moosonee on James Bay, a train I took and enjoyed -- and runs to this day. On the right is CN's Senneterre - Noranda-Rouyn run, photographed in Cadillac, Quebec, that same year. 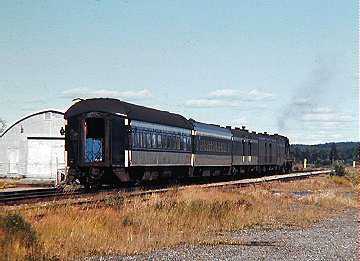 Senneterre was a major northern junction point, serving trains to Chibougamau and Cochrane-Montreal-Quebec. VIA Rail Canada provides three day per week service from Montreal to Senneterre today. Ontario Northland hosts Northlander service six days per week to Cochrane from Toronto via North Bay. With the coming of summer many eyes look North for fresh air and heritage railroading. We can also keep an eye on VIA Rail Canada, which has made a major new purchase of coach, sleeper and diner equipment and vows to take a look at restoring cuts made in its infamous 1990 downsizing. Perhaps we will find an omen here for Amtrak????? Changes last made on: July 2, 2002.